This contemplative itinerary is centred on the ruins of the church of San Giovanni Battista, abandoned for centuries and recently retrieved from oblivion. 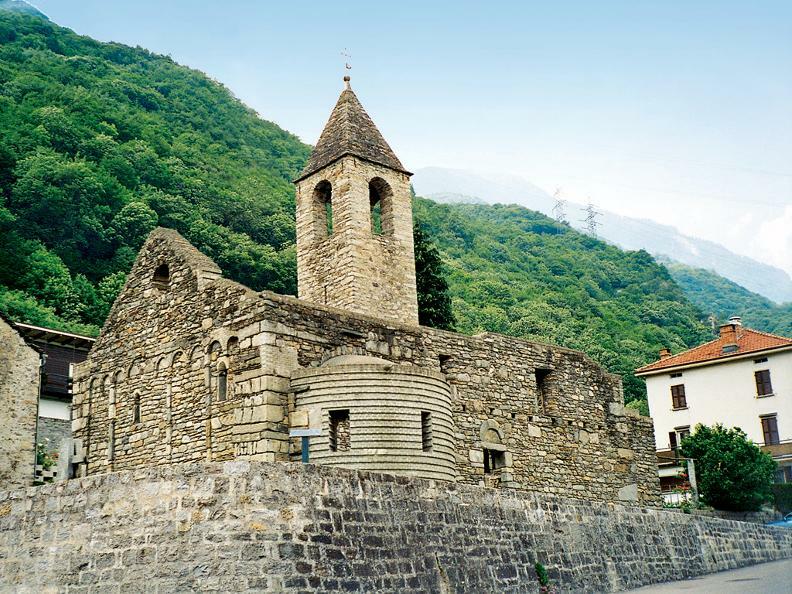 This church, near Bellinzona is a monument with a very complex history; interestingly it demonstrates how, with intelligence and thought it is possible not only to save a building, giving it new form and significance, but also change its function, and give it a new lease of life. The area offers other points of interest, including the convent of Claro on the opposite side of the valley, not many kilometres away from San Giovanni Battista. The convent was founded in 1490 and is one of the spiritual landmarks of Ticino. This itinerary offers an opportunity to compare the Romanesque ruins of San Giovanni, symbol of the passing of time, with a living example of monastic life in the Benedictine Convent of Claro, proof of Man's age-long need for silence and meditation. San Giovanni can be reached from the centre of the village of Gnosca, in the area known as Riviera, not far from Bellinzona; follow the Canton road from Bellinzona to Biasca, turning left at the beginning of the village. After a visit to the restored ruins, the trip continues over to the south side of the valley, the village of Claro and the Oratory of saint Ambrogio. From the oratory an comfortable mule track threads its way through chestnut trees and in thirty minutes brings you to the complex of monastic buildings built on a rocky spur above the oratory. Alternatively you can drive up the narrow road or else take the cable car up to the convent; this is operational on request. Beside the convent are the cemetery and the church dedicated to Our Lady of the Assumption, with its frescoes and precious, gold painted wooden Pieta. The sisters who live in this convent follow the rule of saint Benedict - silence, prayer and work. They embroider vestments, look after the kitchen garden, keep farmyard animals and undertake restoration work. The church of San Giovanni Battista, or at least what is left of it is in the middle of the village of Gnosca, to the south of the residential area, next to the road which cuts through the village. Its complex history starts from the time it was built in the first half of the 12thC; for years it was fought over by Como (Romanesque liturgy) and Milan (Ambrosian liturgy). San Giovanni is first mentioned in a 1202 document affirming that it belongs to Como. It is known that, at the time, the other church of Gnosca, dedicated to saint Peter martyr, was part of the diocese of Milan. This contention persisted right up until the end of the 18thC, despite reconciliatory intervention by the archbishop Carlo Borromeo in 1583. In 1783 the bishop of Como decided to put an end to this controversy over the different liturgies by ordering the de-consecration of the church of San Giovanni. (He may also have had economic reasons for his decision). The document drawn up in 1202 affirms that the church had been consecrated some 70 years earlier during the first decades of the 12thC. It was a simple Romanesque church, facing east, consisting of a nave and a semicircular apse. Between the end of the 15thC and the first half of 16thC the church was enlarged; the nave was extended after the demolition of the north wall, and a new apse was built changing the orientation of the church by 90 degrees. Most probably the decorations belong to the same period referred to in the pastoral records of 1583, but have long since disappeared. The bell tower was built in 1627, the sacristy several decades later. During the de-consecration the vestments, altar cloths and holy vessels, as well as the baptismal font, the altar and the roof were all removed. In the years that followed the weather, vandals, and the ease with which useful stones could be removed reduced the ex-church to a mass of ruins. After the survey made by the scholar Rahn in 1872, there was a renewal of interest in the site, and relative documents were researched, but in 1923 the ruins were auctioned and bought by a local family who later turned it into a hayloft. The historian Emilio Motta proposed that the ruins be included in the catalogue of protected properties but without success. The proposal was renewed by Virgilio Gilardoni in 1955 and this time it was accepted. In the '60s the ruins were bought by the town council of Gnosca. The first restoration project never materialised, but the second was entrusted to the architects Tito Carloni and Angelo Martella and carried out between 1992 and 1993. Preliminary archaeological research carried out before 1991 established that there was no building prior to the Romanesque church of 12thC. Six graves were discovered in the nave, some of children and one with the deceased buried in a sitting position. About twenty coins from the mints of Milan, Pavia, Venice, Asti and Ivrea (15thC) were also discovered. Other tombs around the church revealed the existence of a cemetery that was used up until the deconsecration. The architects' (Carloni and Martella) plan for restructuring the church was never intended to restore it to its original religious function, but rather to enhance the form and space , making it accessible to a variety of alternative uses. Once the area had been cleared and tidied (brambles and brushwood had invaded the site and taken possession of the ruins) the remaining masonry was reinforced and then some of the missing parts were reconstructed. Modern materials were chosen - blocks of concrete which don't imitate stone but harmonise with it both in colour and appearance . The flooring, which was badly ruined, has been re-laid in concrete blocks: even the apse has been protected with a layer of cement. The work has been carried out in such a way as to underline the differences between the old and the new . The pediment to the south is the most complete; the walling is made of irregular ashlars; some of the pilasters, crowned with blind arches , give a rhythmical quality to the façade, pierced by two single lancet windows and a round opening as well as traces of an antique portal. The first apse can still be seen to the east and has been almost completely rebuilt together with a delightful aperture . The entire project was executed with great respect, and has restored dignity and new symbolic purpose to San Giovanni. Over the last few years it has developed into a fascinating and functional exhibition area. Built on an ancient 12th century oratory, the parish church of Santi Nazario e Celso has been completely rebuilt.